Mario Balotelli answered the call on Thursday evening in Warsaw. After drawing criticism for squandering several chances earlier in the tournament, Balotelli buried two opportunities in the first half today, to lift Italy to a stunning 2-1 victory over tournament co-favorites Germany. Italy came into the match marked by most as underdogs, but they had not conceded a goal in over 200 minutes of competition, since conceding to Croatia in their opening match of the tournament. Their defense remained strong in the early stages of the match, determined to carry out the tactic of isolating Germany's Mesut Ozil from his teammates. 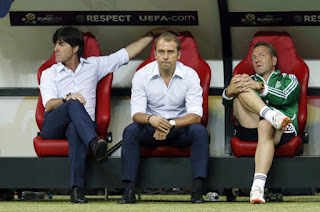 Joachim Low opted to play Tony Kroos in place of the previously favored Thomas Muller and it may have cost him in the end, despite Muller featuring for the final twenty minutes of the match. Italy's first strike came off of an excellent turn by Antonio Cassano followed by a cross sent in from the left. Mario Balotelli elevated over Holger Badstuber and headed it past Manuel Neuer for the opening goal. It was a great break that began with a splendid pass from Andrea Pirlo, who continued his midfield dominance in this match. Balotelli celebrated his goal by embracing his teammates, particularly Cassano, who could not have played a better cross. In the ensuing minutes after the goal, Germany enjoyed the majority of the chances and forced several saves from Italian captain Gianluigi Buffon. Despite appearing shaky in the early stages of the match, and nearly conceding if not for the poise of Andrea Pirlo guarding the post, Buffon regained his composure and turned in a spectacular performance in the Italian goal. Buffon's best save came against Sami Khedira on a blast from outside the penalty area that Buffon was just able to push wide with an outstretched hand. 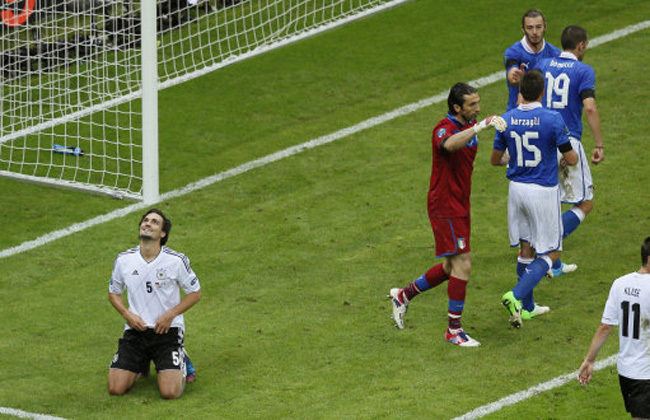 The decisive break came for Italy just three minutes after Khedira's thwarted blast. Ricardo Montolivo found Mario Balotelli alone in space behind the German defense. The Manchester City striker accepted the ball with ease, built up speed, and then unleashed an emphatic blast that found the upper corner of the goal. Manuel Neuer was helpless to prevent the goal and was rooted to the spot, the second time this evening he found himself in that predicament. 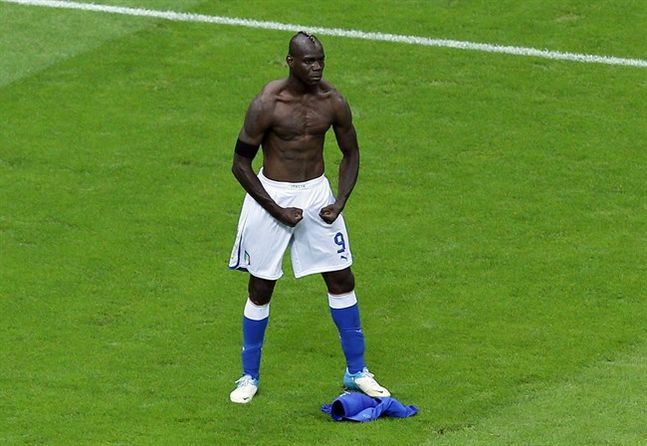 Balotelli received a yellow card for removing his shirt in celebration, but he will not miss the final as a result of accrued cards. Following the halftime break, Joachim Low substituted striker Mario Gomez in favor of Marco Reus. Reus nearly provided his manager with a saving goal, coming off a free kick in the 62nd minute, but once again Gigi Buffon rose to the occasion and parried the shot over the net. Following that moment, Germany looked increasingly desperate. Their main service came from the wings in the form of desperate crosses that never found their mark and were easily dealt with by the cohesive Italian defense. As Germany looked increasingly desperate they left massive holes in their defense. Italy was unfortunate not to score on these opportunities and squandered several due to poor finishing. When one such chance eventually went in the net, it was ruled offside by the linesman, another opportunity to seal the deal wasted. Germany finally got the opportunity they sought thanks to a fortunate decision from the referee when the ball struck the arm of Federico Balzaretti in the 91st minute. Mesut Ozil capably stepped up and finished the penalty, despite Gigi Buffon diving in the correct direction. The late goal did not give way to the dramatic finish that Ze Germans sought, and the Italians celebrated their deserved victory. Italy will now face Spain, in a rematch of their group stage matchup where they drew 1-1. The juxtaposition of styles and expectations of the fans should make for an entertaining game, despite Spain drawing criticism for playing some dreadfully boring football throughout the tournament.